ROME, December 4, 2012 – The title of this article is the same one that “Avvenire” gave to a feature report from Marseille by its correspondent Marina Corradi, in the footsteps of the pastor of a quarter behind the old port. A pastor whose Masses are crowded with people. Who hears confessions every evening until late at night. Who has baptized many converts. 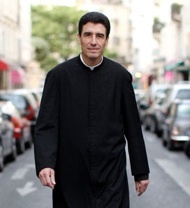 Who always wears the cassock so that everyone may recognize him as a priest even from far away. Michel-Marie Zanotti-Sorkine was born in 1959 in Nice, to a family a bit Russian and a bit Corsican. As a young man he sang in the nightclubs in Paris, but then over the years there emerged the vocation to the priesthood he had had since his childhood. His guides were Fr. Joseph-Marie Perrin, who was Simone Weil’s spiritual director, and Fr. Marie-Dominique Philippe, founder of the congregation of Saint John. He studied in Rome at the Angelicum, the theological faculty of the Dominicans. He was ordained a priest in 2004 by Cardinal Bernard Panafieu, the archbishop of Marseille at the time. He writes books, the latest of which is entitled “Au diable la tiédeur,” to the devil with lukewarmness, and is dedicated to priests. He is pastor at Saint-Vincent-de-Paul. And in this parish on Rue Canabière, which leads from the old port through ramshackle houses and shops, with many homeless, immigrants, Rom, where tourists do not venture to go, in a Marseille and in a France where religious practice is almost everywhere at the lowest levels, Fr. Michel-Marie has made the Catholic faith blossom again. How? Marina Corradi went and saw. And she tells what she found. That black tunic fluttering along Rue Canabière, among a crowd more Maghrebi than French, makes you turn around. Check it out, a priest, and dressed like once upon a time, on the streets of Marseille. A dark-haired man, smiling, and yet with something reserved and monastic about him. And what a story behind him: he sang in the nightclubs in Paris, was ordained only eight years ago and since then has been pastor here, at Saint-Vincent-de-Paul. But in reality the story is even more complicated: Michel-Marie Zanotti-Sorkine, 53, is descended from a Russian Jewish grandfather who immigrated into France and had his daughters baptized before the war. One of these daughters, who escaped from the Holocaust, brought into the world Fr. Michel-Marie, who on his father’s side is half Corsican and half Italian. (What a bizarre mix, you think: and you look with amazement at his face, trying to understand what a man is like who has such a tangle of roots behind him). But if one Sunday you enter his packed church and listen to how he speaks of Christ with simple everyday words, and if you observe the religious slowness of the elevation of the host, in an absolute silence, you ask yourself who this priest is, and what it is in him that draws people, bringing back those who are far away. In front of a frugal meal, the highlights of an entire life. Two splendid parents. The mother, baptized but only formally Catholic, allows her son to go to church. The faith is imparted to him “by an elderly priest, a Salesian in a black cassock, a man of generous and boundless faith.” The desire, at the age of eight, to be a priest. At thirteen he loses his mother: “The pain devastated me. And yet I never doubted God.” Adolescence, music, and that beautiful voice. The piano bars of Paris, which may seem little suited to discerning a religious vocation. And yet, while the decision slowly ripens, the spiritual fathers of Michel-Marie tell him to keep to the nightlife of Paris: because there as well a sign is needed. Finally the vocation pays off. In 1999, at the age of 40, his childhood wish comes true: a priest, and in a cassock, like that elderly Salesian.